Earlier tonight I was on facebook and I found some great pictures on "Kurt Kuthe's" page. 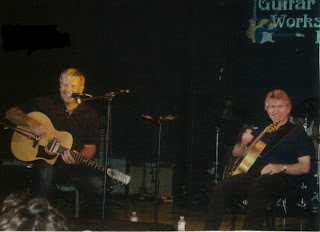 Guitarists Alex Lifeson and Rik Emmett at the 2006 Guitar Workshop in Toronto, ON. All I have to say is AWESOME! My two favourite Canadian guitarists jamming it up on the same stage! 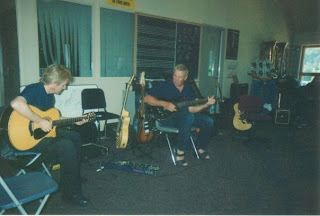 A couple years back I attended a guitar clinic show by Rik Emmett here in Sarnia and I was front row watching a master at work! After the show I had a chance to talk with Rik while he autographed a poster and made suggestions on great Yamaha brand guitars! The event was sponsored by Yamaha Music Canada. The best $5.00 ticket I ever bought!!! I have yet to meet Alex Lifeson or see him play live with "Rush". Hopefully someday I will get that chance.